library | Brad OH Inc. The following is an interview with Trudie Aberdeen, who appears in the Brad OH Inc. and Hal J. Friesen edited Anthology ‘Between the Shelves: A Tribute to Libraries by Edmonton Writers’, which you can now purchase here in either Kindle ($2.99) or Paperback ($12.50) copies. All proceeds are to be donated to the Edmonton Public Library System. Trudie Aberdeen is a long-time language educator and social justice advocate. She is currently working on completing her PhD on the topic of heritage language acquisition. In addition, she teaches English to adult newcomers to Canada. Her academic interests include refugee education, multilingual literacy instructional practices, language conservation, action research, and language instruction for heritage language learners. Her research can be found in the following journals: The Manitoba TEAL, Multilingual Discourses, and the 9th Low Educated Second Language and Literacy Acquisition (LESLLA) Symposium. She also serves as the book review editor to the Canadian Journal of Action Research. The passion for your work is clear in every aspect of your writing. How long has heritage language acquisition been a part of your life? What started it all? TA: I was raised in a middle-class, English-speaking family in Alberta. My childhood was fairly normal. And when I was a little bit older, similarly to most rebellious teenagers, I took my teenage angst and raged against my parents. While others were sexing, drugging, rock-n-rolling and doing other “naughty things”, I inflicted on my father what I thought might have been one of the most painful childhood revolts I could think of: I went to Campus St. Jean and took university in French! On my personal journey to bilingualism, I learned about the power of language along the way. Contrary to current popular belief, I’m not really a natural when it comes to language learning. I’m someone who learns with moderate aptitude and great effort. I was always fairly successful in school, so learning that language learning was hard was a shock for me. So despite by best enthusiasm, I wasn’t successful my first year and was put on academic probation. Because I struggled with the language I was in a place very few white, middle class, English-speaking women with average intelligence ever get to be: I wasn’t part of the mainstream. For me, this is when I realized how language (or lack thereof) can limit one’s chances of success. I finished my degree successfully, although it took me more than four years and I had to spend a year in language classes in Quebec, but I eventually triumphed. I taught in Japan for several years in an international school. I was the English as a second language teacher to elementary school aged children whose parents moved temporarily to Japan for business or diplomatic missions. I saw how quickly many of my students learned English and how quickly many of them forgot their mother tongue. I saw the parents who were “trapped” because if they moved home they could no longer put their children in school because the children couldn’t read or write their “mother tongue”. I also worried a lot for my students who appeared to have learning disabilities. Parents, colleagues and I often asked, “What is this child’s issue? Is it a language learning inability or something bigger?” Often it is difficult to know. When I started my doctoral studies, I began to take interest in adult literacy learners. In my field of English as a second language teaching and learning, literacy learners are adults who grew up never learning to read their mother tongue, mostly due to limited opportunities because of gender, poverty, or war. Their lack of first language education impacts on their opportunity to learn English. They often struggle with things that most of us take for granted: following instructions for over-the-counter medication, signing their children’s homework log, figuring out a map, and reading street signs. Despite all of their challenges, all of those I have worked with have an undeniable spirit, determined outlook, and an often overlooked sense of intelligence. My dissertation, however, looks at heritage language learners. These are usually the children of immigrants who have to navigate cultures and languages, not being conventionally “Canadian” and first-language English speakers, but not being of the same language and culture as their parents, either. Most of these children struggle to keep the language of their parents and cannot without the help of a larger language community and school. My work is looking at how schools and communities can support these students. Heritage language learners and adult literacy learners do not initially seem connected, but they share many commonalities. Both groups often are trying to learn language in an environment that is limited in exposure to language. Both are often trying to learn language without literacy. In many instances, these two groups can be within the same family. Some immigrant parents (especially those with limited literacy) can struggle to learn English and their children can struggle to maintain their first language. In my line of work I have met many people who are unable to have a basic conversation with their parents because they do not know enough of each other’s language to exchange more than limited small talk. There seems to be a message or end goal with your writing / research. What is it you hope to achieve at the end of your dissertation? TA: I hope to show the world exactly how much expertise exists in the field of heritage language education in Alberta. I wish politicians, educators, and scholars to know about the challenges and limitations that programs face so that they can receive better support in doing what they do best. Who has inspired you as either a writer or researcher? TA: My four favorite researchers are Dr. Olenka Bilash, Dr. Kenneth Schaeffer, Dr. Nick Ellis, and Dr. Elaine Tarone. All four are gifted scholars and educators. However, what I admire most about them is their compassion and vision for making the world better for others. Would you be willing to share one or two stories from your experience as a language educator? TA: In 2004, I had a beautiful kindergarten student from Sweden called Hedda. She was a dream child: polite, kind, energetic, brilliant, and friendly. She started school in September and by Christmas she was speaking English well. Her reading level was near the top of her class. At the parent-teacher interviews, I gave her parents “the talk.” I warned them about language loss and the importance of first language maintenance. I told them that they had better start planning for her Swedish or else it would be gone. I recommended that they find her a tutor and begin reading lessons as soon as possible. While Hedda’s mother seemed convinced by my message, her father was less so. He responded firmly, but politely, that Hedda was a little girl. She had just made a huge adjustment, according to her father, by leaving her extended family behind in Sweden and moving to Japan, and furthermore, she needed to worry about enjoying herself, not planning for her future education. I responded that while I respected his point of view, he should at least consider my suggestion. He told me that he would think about it after his family returned from their holiday in Thailand. Sadly, all four members of Hedda’s family were lost in the 2004 tsunami that killed more than 250,000 people on Boxing Day. I often think of her and her beautiful family. I often think of the advice I gave to her parents, and consider what her father responded to me. For language learning, we need to have long-term planning, and to prepare for what is coming ahead. At the same time, we need to remember that this moment might be all that we have. Why do you personally think language is important? TA: If you ask a brain researcher or a psychologist, they will tell you about all of the cognitive benefits of bilingualism. Of course, I believe all of these things are true such as bilingualism increasing intelligence and delaying the onset of Alzheimer’s disease. Still for me, the most important aspects of language learning are social in nature. Language connects people to opportunities and it connects us to one another. Check out Trudie Aberdeen’s story “Newcomers to Canada and Edmonton Public Libraries” in ‘Between the Shelves’, which you can purchase now on Amazon. 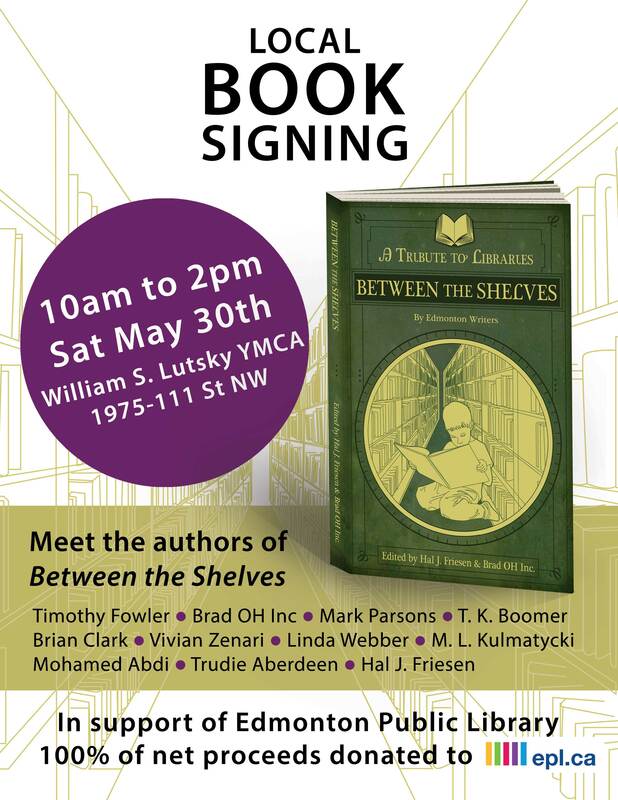 Finally, be sure to visit us for a ‘Between the Shelves’ signing this Saturday, May 30th at William S. Lutsky YMCA (1975-111 St NW) from 10am-2pm! The following is an interview with Author Mohamed Abdi, who appears in the Brad OH Inc. and Hal J. Friesen edited Anthology ‘Between the Shelves: A Tribute to Libraries by Edmonton Writers’, which you can now purchase here in either Kindle ($2.99) or Paperback ($12.50) copies. All proceeds are to be donated to the Edmonton Public Library System. Mohamed Abdi is a Somali-Canadian Writer with a Bachelor’s Degree in Communication Studies. He loves to read mystery and historical fiction novels and has written articles for both online and print magazines. Mohamed lives in Edmonton with his wife and children. Did the EPL play a significant role in your own immersion into Canadian culture? MA: Absolutely. Edmonton Public Library has played a significant role in my broad understanding of Canadian culture and enabled me to immerse myself into the culture. This comes in the form of reading different books written by diversified authors, and I have realized that much of Canadian culture is built on readership and connection with libraries. In fact, I have been partly acculturated as I like to read and borrow books from the Edmonton public library. And readership culture is created and promoted by individual societies. When did you make the decision to start writing in English, and why is it so important to you? MA: My university studies exposed me to writing opportunity, through essays, etc. As a result, I have developed a passion for reading and writing in English. I wrote my first English book in 2004. This was a non-fiction book, which touched on Somalis’ plight and their displacement after the civil war of 1991. I published my second English book in 2012. This was a collection of fictitious, short stories about Somalis’ predicament and their complicated conditions in various places of the world. I think it is so important to me to write in English, for English has become a universal language whose written materials and literature can be comparatively accessed by many people. So by writing in English, I can reach out to a wider audience. What advice would you give to other Non-Native English speakers trying to make their voices heard in English? MA: My advice to Non-Native English speakers is to read as many books as possible, and to start putting your ink on paper and write things you have passion for, or concerned about, in other words. And you must know that your writing skill will not come overnight, but it has to start somewhere and grow gradually. So let you start somewhere and develop your writing skills onward. MA: Somalia’s civil war has inspired me to become a writer. In fact, the insanity of that sinister civil war has set my mind into motion and compelled me to find responses as to why people wreck each other and take their countries apart. Why blood is spilled? Why children are orphaned? Why women are widowed? Are there alternate means of reconciling and resolving conflicts before resorting to the barrel of the gun? MA: I am now working on a novel (historical fiction) about Somalia, but don’t know how it will turn out or where this journey will take me, but I am determined to unleash my imagination and hone my skills for this project. Check out Mohamed Abdi’s story “Learning From Your Library” in ‘Between the Shelves’, which you can purchase now on Amazon. And be sure to join us tonight, May 6, from 7:00-9:00PM for the official launch party in the Centennial room of the Stanley Milner Library! The following is an interview with M. Lea Kulmatycki, who appears in the Brad OH Inc. and Hal J. Friesen edited Anthology ‘Between the Shelves: A Tribute to Libraries by Edmonton Writers’, which you can now purchase here in either Kindle ($2.99) or Paperback ($12.50) copies. All proceeds are to be donated to the Edmonton Public Library System. M. Lea Kulmatycki is a teacher and writer. Her work spans academic writing to a senior’s advice column in a local newspaper. She has even written poetry for some charitable events. After many years of writing and publishing teaching materials, she decided to focus on her first love, fiction. She is also on the board of directors of the Young Alberta Book Society. This short story seems to scratch the surface of a much broader world. Is “Library Lost” going to be continued or expanded elsewhere? MLK: Yes, I’m hoping to expand the story into the first book of a trilogy. How has your academic and column writing influenced your fiction writing? MLK: Research is crucial to academic and column writing. It’s also important when writing a fictional text. I want my readers to connect to my stories and it won’t happen if something is unbelievable or inaccurate. I research to make sure my description of real-life objects, places, etc. is accurate. I also research when creating a new object or process for a story. It won’t be believable if it’s not based on something that works in the real world. For one story, I thought an obsidian sword would be a fitting weapon for the evil antagonist. Unfortunately, there was no way to get around the fragile nature of the material. How has your poetry experience influenced your writing? MLK: Writing poetry has taught me the importance of using precise language as well as words that flow together and sentences that either complement or contrast one another. I re-read my work aloud so I can work on the sentence fluency. As a teacher, is your target audience the youth whom you taught, or are the end goals of your teaching and writing completely separate? MLK: I love to write, so I take advantage of opportunities regardless of audience and genre. However, I do prefer writing for children ages seven to ten. I noticed you didn’t give the grandfather a name in the story. Was this intentional on your part to flip the traditional patriarchal forms? MLK: Yes. In my view of a dystopic society, there is always an imbalance of power. When we think of a grandfather, we usually think of someone kind and caring. The insidious nature of power is emphasized by the true nature of “Grandfather” as he hides behind this mask. While the character emphasizes the plight of the Sisterhood, he ultimately reveals its strength. These women will not submit to their oppressors and have chosen to fight for all who are oppressed. As a global society, we have not yet escaped this power struggle. It exists in many forms – gender, race, wealth, etc. I’m an optimist. I believe world peace is achievable, but I believe we have a lot of work to do to change the imbalances in our global society so we can live in peace. MLK: Martyn Godfrey. I met him early in my writing career. He was a wonderful person and phenomenal writer. Kids connect to his stories and I hope that kids will connect to my writing in the same way. A few years ago, I was given a book written by Dan Abnett. I love his Eisenhorn and Ravenor series. He is a superb storyteller and I admire his use of the English language to engage the reader. M. L. Kulmatycki’s story “Library Lost” is featured in ‘Between the Shelves’, which you can purchase now on Amazon. 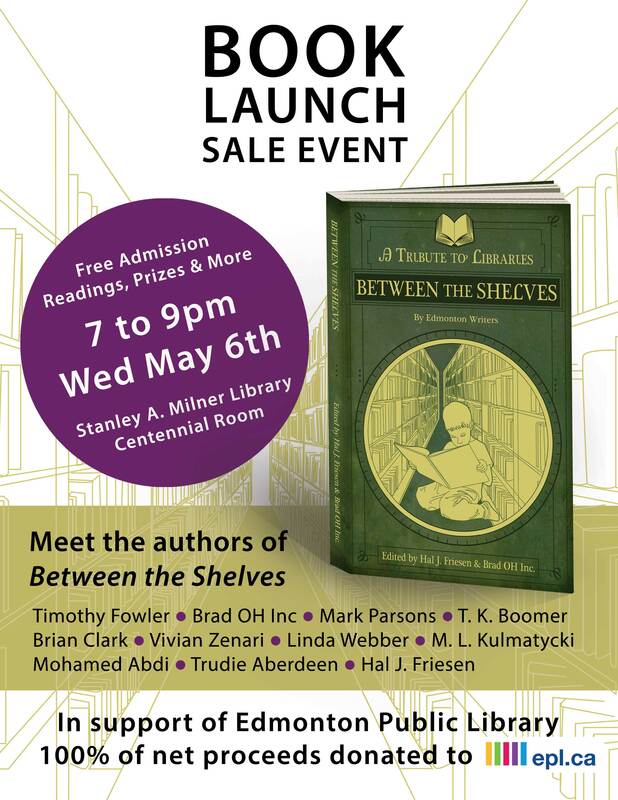 And be sure to join us May 6 from 7-9PM for the official launch party in the Centennial room of the Stanley Milner Library.